Product Design, User Experience, Interface & Creative Direction. I work with enterprise, agency & startups developing customer problems into innovative solutions. I’ve run the gamma of design jobs over the last 20 years, from web to mobile UI, UX and now product design. I try to push creative boundaries in all facets of work from research, lean UX to Sketch. I’m constantly evolving, constantly experimenting and constantly creative. I have an overwhelming need to create and have had the pleasure of doing so with brands like CBA, Qantas, West Coast Customs, Paypal, Hotwheels and Telstra, to name a few. Over 20 years of design has allowed me float across all sorts of industries and meet a plethora of awesome, talented people. So myself and three friends banded together, started an agency. At We Discover we believe the corner stone to any successful product starts with Customer Research and Discovery. This gives us the behaviours and insights we need to craft the best UX and UI Design possible for the right target audiences. We also use iterative Prototyping to get customer feedback earlier rather than later. With this approach it means that when we move into Agile development we’re confident we’re building a Customer Experience that will be second to none and a MVP that can scale and stay up. Beam is a product I designed whilst at IAG within Edge Labs. Presented with an opportunity to create a product, brand and experience starting with a connected home hub, alongside the disruptive tech team. Leveraging their existing security business, we launched a new brand and initial product package focused on connected home security for millennials who want more than just a traditional security system. This was an awesome opportunity to showcase my end to end design, leading the project from research, contextual inquiry, product to market fit, branding, UX, UI and even creating the product renderings and marketing consultation - all within a tight timeframe of a few months. Beam is set for expansion this year with NRMA with new products coming and more marketing push. I4T offers simple, affordable single item insurance. I redesigned their brand, UX/UI overhaul to create a modern, mobile focused experience. Parallel Parking, dubbed the Airbnb of parking, is a startup I helped mentor and update aspects of their mobile and online experience, by offering UX/UI design and marketing consultation. Loved working with these guys, and I'm impressed with their success & recent acquisition by Spacer. I led the UX/UI for AusSuper’s updated mobile app for both iOS & Android. This was one of the first projects to utilise their new brand guidelines and include self managing fund tools. ShareCover is an insurance product for Airbnb, Stayz and share housing hosts. I created their new online experience, UI/UX and product development and brand guides. New online experience is launching soon through IAG's Firemark Incubator. Though it seems like a lifetime ago now, what began as my first large client at age 18, developed into an eight year progression in which I grew the brand online and found myself intertwined into the business. Constantly flying in and out, developing new sites, online stores, ventures, events and social media whilst the brand grew to international success and iconic pop-culture status. For me, this was jumping head first into the deep end and opened up experiences and opportunities around the world as I assumed the role of Creative Media Director, until eventually moving onto new ventures in Australia. I produced this feature with my friends at 800Kamerman, an Emmy-award winning production company in California. I was driven to produce this as I was wanting to get in front of the camera more, I really enjoyed being on set and working with the MTV and Discovery crews. It turned out to be a vital piece of marketing in the following years, albeit shameless self promotion. This is my untold story of a small town kid who gets a big break. Heart broken, roaming the earth designing, in search of anything to stop being homesick, as turning back was never an option. The mini site features a pod-style story and some never before seen photos from behind the scenes over 8 years. It’s important to take a break from digital sometimes and design something in the physical world, ya know - something you can touch that isn't on a screen. 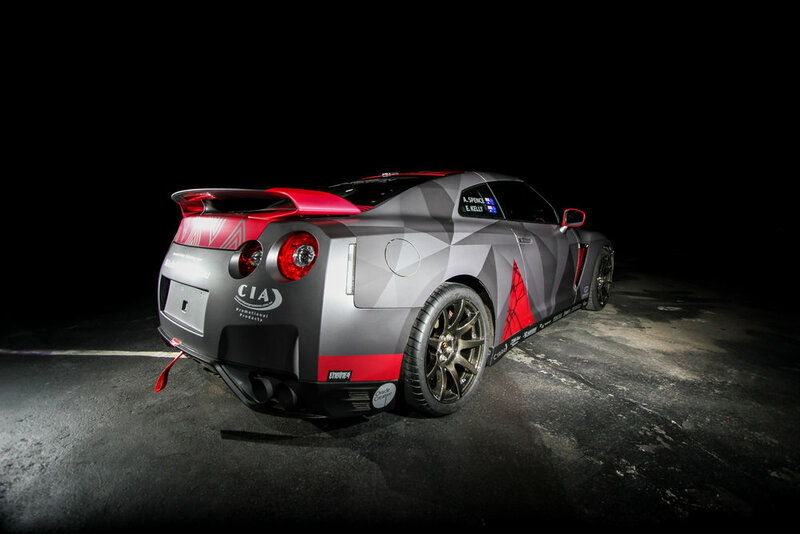 I created Redback Racing’s new brand design, renderings and vehicle wrap for their Nissan GTR & support vehicles. My design was remixed for a 2006 Honda Integra DC5 Type R, built to compete in QMMF's Qatar Challenge 2015-2016 at Losail Int. Race Circuit.